Tangka are a type of complex artworks, beautiful art objects, full of mystery, spirituality and peace. They are created to be used in devotional meditation, in places of worship or in private homes. This exceptional pictural art, started in Nepal, in the seventh century under the name of `Paubha`when Hindus introduced Mahayana Buddhism into Tibet. It carried the cultural, artistic and spiritual traditions of Buddhism and Hinduism. To meet the demand of the temples and new converts, monks and traders acquired Buddhist sculptures, but due to the increasing demand for icons, Nepalese artists inaugurated a new type of religious painting on textile, convenient to roll up and to transport. The cultural, artistic and spiritual exchanges were conveyed by the monks and scholars, who went from India to Tibet, and then to China. 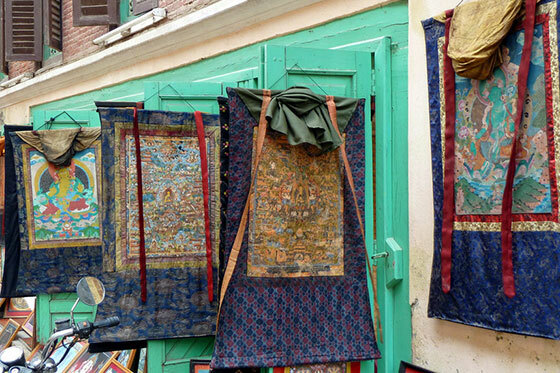 They went along the Kathmandu valley and stopped in the monasteries of the cities of Patan or Bhaktapur. A myriad of peaceful or wrathful deities populate the Tibetan Buddhist pantheon. Meditating buddhas, Bodhisattvas or terrifying protective deities of Indian, Buddhist or Tibetan origin were invoked to watch over health or harvests. In the monasteries, these figures were in the middle of complex tantric rites. Through time, these diverse influences came together to form a truly unique and distinctive form of art. 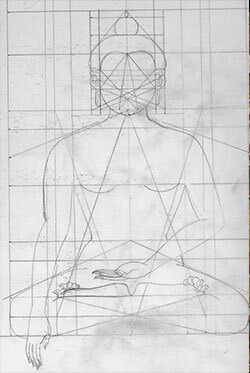 "Paubhas" are of two types, the Palas which are illustrative paintings of the deities and the Mandalas, which are mystic diagrams paintings of complex test prescribed patterns of circles and square each having specific significance. 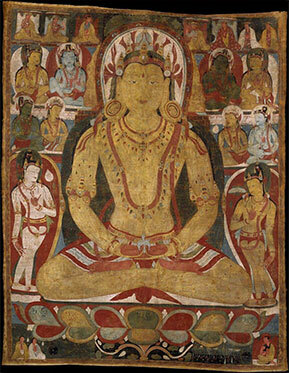 In the 15th century, this art was developed in Tibet and Bhutan and 'Paubha' were called Tangka (painted scroll). The composition of the first Thangka was very simple and often incorporated the central figure - normally a deity - surrounded by many smaller and less important figures. From the fifteenth century onwards, brighter colours gradually began to appear in Nepalese thangka. Because of the growing importance of the tantriccult, various aspects of Shiva and Shakti, Mahakala and Manjushri were painted in conventional poses. As Tantrism embodies the ideas of esoteric power, strong emphasis is put on the female element and sexuality in the paintings of that period. Based on technique and material, tangkas can be divided into types. Generally, they are divided into two broad categories: those that are painted “bris-tan" and those made of silk, either by appliqué or embroidery “gos-tang”. Painted thangka may be subdivided into several categories, depending on the shade of the background, gold, black, red or different colours. 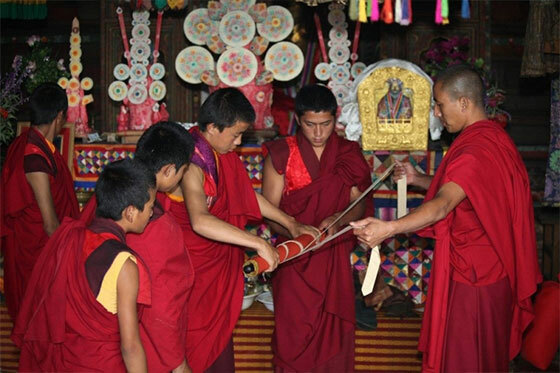 There are also many regional styles and techniques or community specifications, among the Gurung and Tamang ethnic groups in particular, in the Northeast at the foothills of the Himalaya and in Mustang. 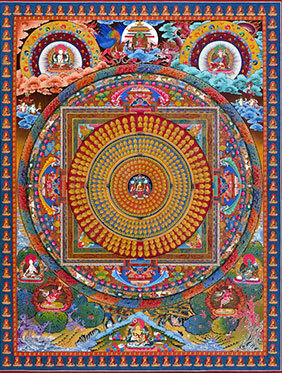 It can be said, however, that the artist is not given very much creative freedom when painting thangkas, but must follow prescribed rules concerning the content, colour, proportion and composition of the work. That is one of the reasons why thangkas are rarely signed. Another reason is that pious Buddhists strive to rid themselves of ego, thus signing one’s artwork is seen/would be considered as an egocentric act. Nevertheless, there might be exceptions. For any large project, the artist must visualise the final colour scheme before beginning to paint. The colours he envisages are noted in abbreviation on the sketch. The first step is to prepare the canvas, which is extremely important since the work is to be rolled and unrolled. A piece of open-weave cotton cloth is stretched over a larger wooden frame along its sides, using strong thread to bind the cloth to the frame with criss-cross laces. Then, a certain type of gesso is spread over both the front and back of the canvas to block the holes and then scraped off with a stone to produce smooth and lustrous surfaces. The artist will have to rely on a grid of exactly positioned lines to sketch the deities. The basic system of these coordinates is one vertical and two diagonal lines as well as four outer borders. The intersection of these three lines defines the centre of any Thangka. 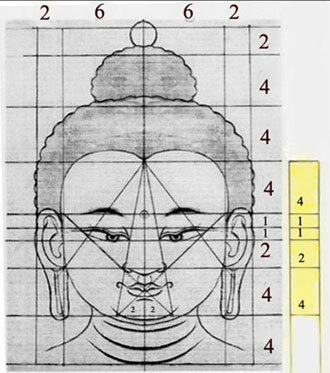 In Thangka having more than one figure, there will be additional circles and connecting lines, to contrast the main icon with the background figure. Using charcoal or graphite, the artist then sketches the deity in accordance to canonical proportions. The featured deity always occupies the centre -while other attendant deities surround are comparatively smaller in size - in order to stress the majesty of the central figure. The paint consists of pigments in a water-soluble medium of grass and yak glue. Both mineral and organic pigments are used. 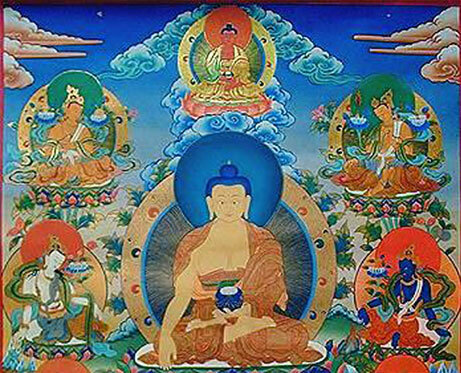 There are five primary colours used in Sacred Buddhist paintings, of which each has a symbolic meaning: white is the colour of purity; green is the colour of balance and harmony; red is related to wisdom and dignity, but also destruction; yellow symbolizes humility and renunciation; blue is associated with healing, calm and purity. There is a definite, specific sequence to colour application. 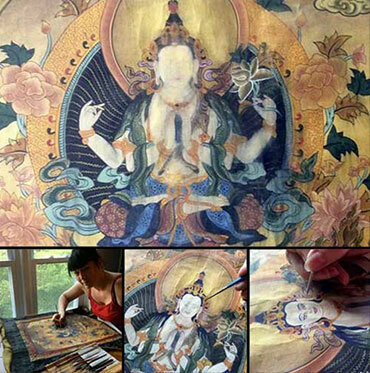 In general, the thangka is painted from top to bottom. This means, the artist starts with the areas further away from him and finishes with the details closer to him. Once the first layers have been applied, the following ones are thinner and the dyes more diluted. In these holy paintings, there are no effects of perspective, shadow nor light. Nevertheless, the shadow can be applied downwards to add volume and dimension effects to figures and decorative elements. Sometimes the great flatness in the foreground gradually fades into the horizon, which is often obtained through "wet shading". The original detailed lines of the objects which have been covered by paint are redrawn in pencil and traced over in black ink. This is carried out in order to set off items in the background or to underline important details. For this ‘eye opening’ (when the faces are painted) -part of the process, there is an elaborate ritual in a spirit of peace that is scheduled on an auspicious full moon day. After the ritual, the artist paints the eyes in quick, sure strokes. The white of the eyes is softened with orange and the corners ends with red; the edges of the eyelids are darkened and the iris is added. The two most common types of eyes are ‘bow’ eyes and ‘grain’ eyes, although there are other types including fierce-looking eyes on wrathful deities. The golden areas are polished with an onyx-tipped tool, the lace-bindings cut and the canvas sewn on silk or brocade. Sometimes a very light and transparent silk veil is stretched over the canvas like a curtain. The last step is to attach fine rolls of lacquered wood to the top and bottom of the canvas, so that it can be easily rolled or hanged up. 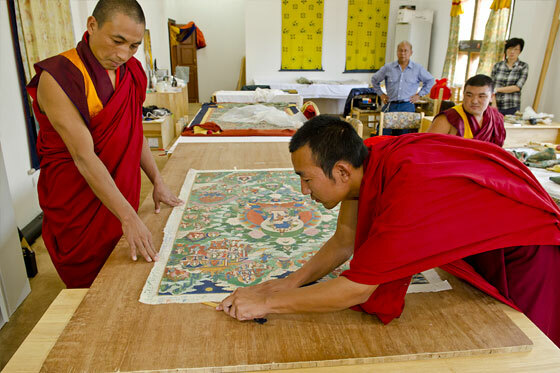 During the year, according to religious holidays of the lunar cycle, specific thangkas are removed from storage, unrolled and hanged up – sometimes in damp and smoky shrine halls – then taken back down, rolled up and put back into storage. Thangkas are often stored in airtight tin boxes to protect them from mice and rats, but it does not allow the material to breathe. For this and other reasons, existing thangkas from earlier times have sustained damages and it is sometimes difficult to tell if the painting has been remounted or altered. 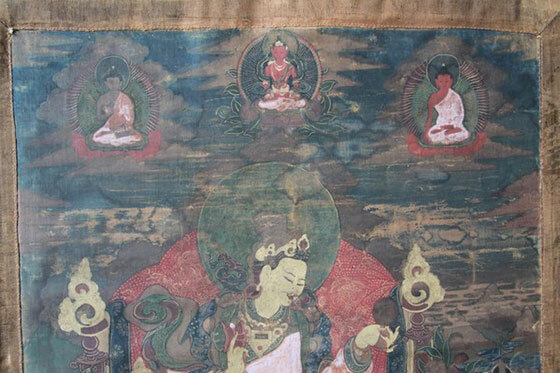 When thangkas are on display in their original Tibetan settings, the original colours may have been exposed to soot and airborne debris from burning butter lamps and incense. The most susceptible element of these painted scrolls is their cloth borders, often made of silk brocade. 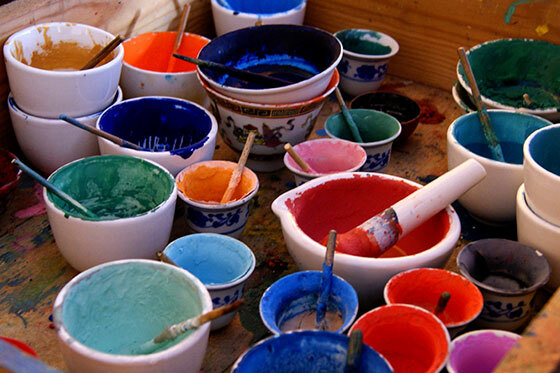 It happens frequently that layers of colours or pigments have been chipped by water damages (yak-glue is very sensitive to humidity in particular). As a result, flat colours of under-drawings appear which the artist did not intend to be seen. Before undertaking conservation, it is important for conservators to take into consideration the iconographic and religious content as well as the symbolism in relation to colours. Ideally, no aspect of the treatment must compromise the original purpose of the object. In addition, the restorer must be careful not to confuse the notes referring to the colours, with the iconographic lettering intended to specify scenes and figures.